Burlington is our home town and we know the wildlife and pest control needs of residents and business first hand. In fact, we've possibly removed thousands of nuisance animals from homes and commercial properties in the area. From raccoon in attics to wasp nests in back yards, our job is to keep you pest free! 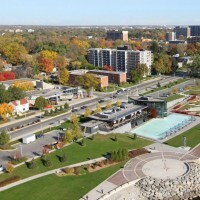 With a population of over 175,000 and growing, Burlington residents enjoy Lake Ontario to the maturely developed south and the Niagara Escarpment to the north. South Burlington has a rich, mature tree canopy within the urban environment. This is perfect for the squirrel and raccoon populations, which thrive in the area. To the north, continued development continues to displace wildlife and rodent populations. Co-existence of wildlife with residents and displacement combined with changing seasons means wild animals and pests are looking to warm and comfortable shelter to make their new home. Animals can pry their way into your home and property; into your attic, under your decks, into basements and garages and even inside the walls of your home or business! , this is your property! The natural environment that makes Burlington beautiful is fantastic for residents, but it is also great for the wild animal and pest population. Homes surrounded by greenspace, parks, ravines, golf courses and other natural open spaces are susceptible to pest problems. Protected areas like the natural escarpment are breathtaking, but are also an ongoing source of wild animals. This is particularly an issue in growing North Burlington. We deal with nuisance animals, rodents and insects commonly found within Burlington and employ best practices to rid them from your property. Humane animal control and removal services means we never harm wild animals. Just as importantly, we treat your home with respect, focusing on doing the job right without damaging property and we even offer clean up services. We are certified exterminators and experienced wildlife control experts and proud to serve the Burlington community!